don't let the small details slip through the crack. I'm glad you're here and taking the initiative to stay organized and on top of the wedding planning details. If you're like most, you've booked your major vendors and have an idea of how you want your day to look, but don't know where to begin when it comes to planning the small details that add character and personal touch to your wedding day. 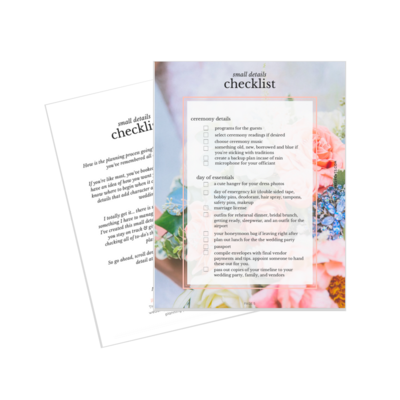 I'll send this checklist straight to your inbox!